The SSB operator should not be afraid of a little compression. We learned very early in our RF-engineering careers, designing military and commercial HF radio equipment, that approximately 6 dB of compression is required to push the loudness contour of the received signal up to the next curve in the Fletcher-Munson family of loudness curves (see Fig.1). This is a good compromise, as excessive compression can give rise to unacceptable distortion - especially on plosive sounds and at the beginning of a voice transmission. Fig.1: The Fletcher-Munson loudness curves. Since RF speech processing was the key to the performance of low-power HF-SSB radio sets - and is now recognised almost as a sine qua non in SSB transmitters - the principles involved will be described briefly. Typically, unprocessed speech has a ratio of instantaneous peak to average power of about 16dB (see Fig.2). In a peak-power-limited system, such as an SSB transmitter, this represents a considerable loss of potential output power, so some means of compressing the dynamic range of the speech signal is required before transmission. It is now well known that clipping (or hard limiting) the peaks of an SSB waveform, and then filtering by a second bandpass filter similar to that in a filter-type SSB generator to remove the resulting harmonic and high-order products, can markedly improve the articulation index of the transmitted signal. Ways of doing this were just being developed in the early 1960s. Ref.1 describes a very elegant alternative compressor design. In modern, DSP-based HF-SSB transmitters and transceivers, the DSP executes the compression function at IF, and wholly in the digital domain. There is a detailed discussion of this in Ref.2, Section 5-5, "Speech compressor", p.16. Compression is implemented in conjunction with suitable pre-emphasis* of the voice frequencies, provided by the type of microphone used, to ensure the appropriate balance between vowel sounds and sibilance. The acid test of its effectiveness is to compare two transmitters of equal peak envelope power (PEP); one processed, the other not. If specifications matter more than performance, then a spectrum analyser will produce all the "numbers" but say nothing about the quality of communications. However, such instruments are rare in the ham-shack. Thus, the enterprising radio amateur will use simpler measuring techniques. These methods are highly ingenious, and will yield a useful quantitative and qualitative picture. Most often, the test instruments consist of an in-line RF power meter and a selective receiver. *Modern microphone elements are peaky, e.g. 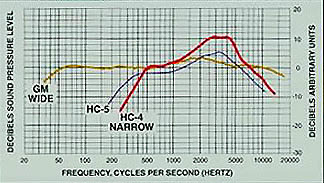 the Heil HC-4 (+10dB at 2kHz) and HC-5 (+6dB at 2kHz). By using one of these elements in conjunction with the transceiver's treble equalisation settings, one can tailor the pre-emphasis for optimum results with 6dB of compression. At the same time, the lower -6 dB point of the transmitter's AF response should be no lower than 250 to 300 Hz. Otherwise, excessive low-frequency speech energy will be transmitted, partially offsetting the benefit of compression. To sum up: The secret of effective, articulate SSB voice communications lies in a combination of a -6 dB transmit audio response of 350 ~ 2700 Hz, 6 dB of compression and 6 to 10 dB of pre-emphasis at 2 kHz in the microphone. Whistling into the microphone (by sucking not blowing) produces a very good sine-wave. This signal will then drive the transmitter to its maximum PEP output. Replacing the whistle by a long "aaaah" sound, of no intelligibility but considerable utility to both man and beast, simulates well a continuous waveform containing a range of speech frequencies. When used to drive an unprocessed SSB transmitter it produces an output 10 to 15dB below the whistle, which clearly emphasises the point made above. By contrast, the same whistle and primeval "aaaah", when fed through the processed (compressed) system, might differ by less than a decibel in output level. Many would argue that an "on the air" comparison is the only meaningful arbiter of effectiveness. Such comparative listening tests, of which we conducted a good few in our time, have confirmed that the increased "talk power" of the processed signal brought about a marked improvement in the received signal-to-noise ratio (SNR), while not introducing significant distortion products either within the audio passband or in its adjacent channels. In fact, it was so good in this respect that one commercial customer used to run two independent radio nets on the same carrier frequency, one on LSB and the other on USB! The increase in SNR is equivalent to that obtained by increasing the power output of an unprocessed 5W transmitter by as much as 10dB to 50W. Since every watt on a man's back (or in a vehicle) matters - as more power always means larger batteries and heavier sets - this is not to be sneezed at. In addition, short, inefficient whip antennas are often obligatory for both practical and tactical reasons; therefore optimum transmitter performance is vital. Even in a fixed station operating on mains power, compression can often make the difference between "barefoot" operation and a hefty linear amplifier. In the avionics world, we use compressors with a break point. Below the break point in amplitude, there is no compression; above it, there is about 10dB. This keeps the background noise from being cranked up too much. This is all done in DSP now. For those who wish to explore this topic in greater depth, Ref.3 gives a very extensive treatment of speech processing in HF-SSB radio systems. Ref. 4 is a very lucid explanation and demonstration of the principles of SSB compression. Copyright © 2005, B. A. Austin GØGSF and A. Farson VA7OJ/AB4OJ.